Meguiar's Plastic and Vinyl Coating allows you to easily enhance and protect your vinyl and plastic surfaces! 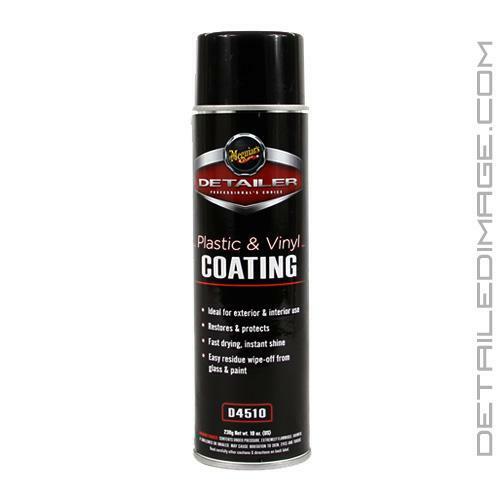 Spray this product onto your plastic and vinyl pieces for the perfect finishing touch. This product will enhance your interior and exterior plastic and vinyl pieces with a dark natural looking finish. The layer of protection left behind will amaze you, while also protecting your plastic and vinyl from fading and cracking. You can even apply it to uneven and textured trim pieces with ease! Simply spray it on and allow it to dry, it is that easy! Any over-spray can easily be removed from your paint or glass with a clean microfiber towel. If you are looking to protect and enhance your vehicle's plastic and vinyl pieces then the Meguiar's Plastic and Vinyl Coating is for you! 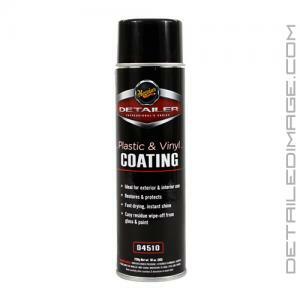 Shines and protects most non-painted plastic and trim surfaces with minimal overspray. This fast and easy-to-use product provides a dark, rich, instant shine without leaving behind an oily residue. Plastic & Vinyl Coating helps protect surfaces from fading and cracking, resulting in the natural, D.E. look. In one easy step, use to shine, restore and protect all interior and exterior textured vinyl & plastic panels, wheel-well guards, bumpers, trim, moldings and more. APPLICATION METHOD: Spray. WARNING! Not for use on clear plastics, control pedals, motorcycle or bicycle seats, tires or painted surfaces. DIRECTIONS: Always use in a well-ventilated area. Shake well. Safe for use on most plastic and vinyl surfaces, but always test first. Hold can 8-10 inches away from clean dry surface and apply using a thin even spray. Product should not be over applied or allowed to run from any surface. Wipe off overspray on paint and glass using Meguiar's Ultimate Wipe Detailing Cloth (M9910). We detail 25 cars a week and this product is used on all of our cars. By far the best. This is ok and works fairly well. Honestly, the Chemical Guys version sprays better. Appearance-wise, after application, there's no difference between this and CG's Back to Black. In the future, I'll go with whichever is less expensive. Can't really go wrong! Works great on vinyl interiors. Easy to use and lasts. The factory finish in a can. I recommend this product.